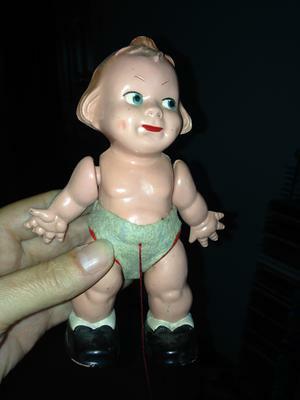 Hi, This doll has been in my family for as long as I can remember (I am almost 50) and probably longer. 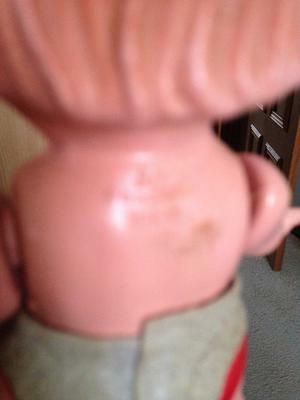 It is a German doll, and I can't find any reference online to the makers mark - I think it says eoh Germany DROM, but I could be with the "oh" - the first letter is definitely an "E". It is a small boy that walks. There is a string with a weight attached at the waist, and you put him on a tabletop with the weight hanging over the edge and give him a little push. He walks (or rather waddles!) until he gets to the edge, then stops. 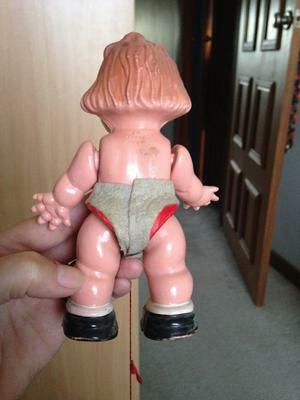 It's not in great condition (we played with him a lot when we were little), and has no clothes except the underpants which seem to be glued on. Looks to be made of hard plastic. 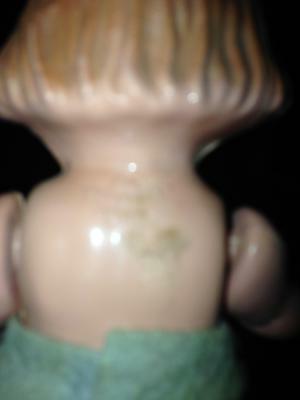 Can anyone give me any information on him?